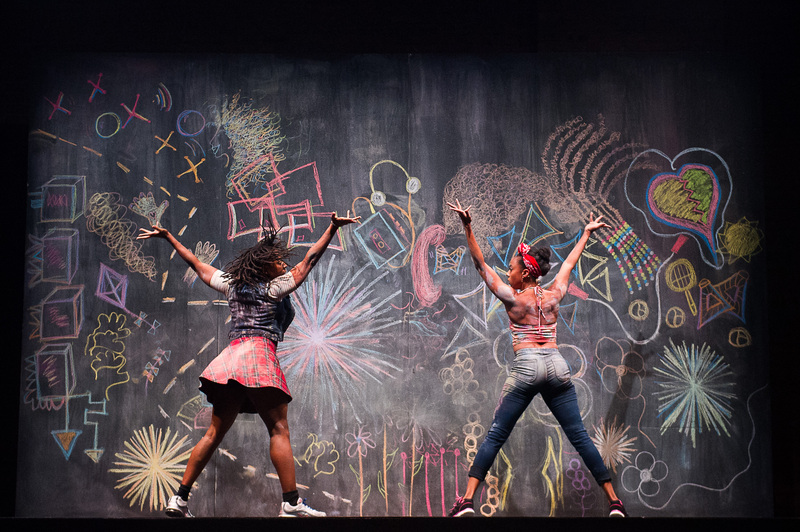 Beatrice Capote (L) and Fana Fraser get covered in chalk from Elizabeth C. Nelson’s set designs. Photo by Christopher Duggan. There’s no question about it – Camille A. Brown is one of the most formidable dancers you can find in New York today. A fiery intensity resides underneath her compact muscularity, making her movements fast, clear, and direct. But within this raw power resides a subtle softness – a trait that comes in handy in her portrayal of her younger self in the world premiere of her latest work, BLACK GIRL: Linguistic Play. So, from the moment the Joyce Theater’s lights came up on her solitary figure staring steadily into the seats, Brown had the audience in the palm of her hand. Camille A. Brown (L) and Catherine Foster keep the beat for each other. Photo by Christopher Duggan. The idea of play is the driving force behind Brown’s choreography. 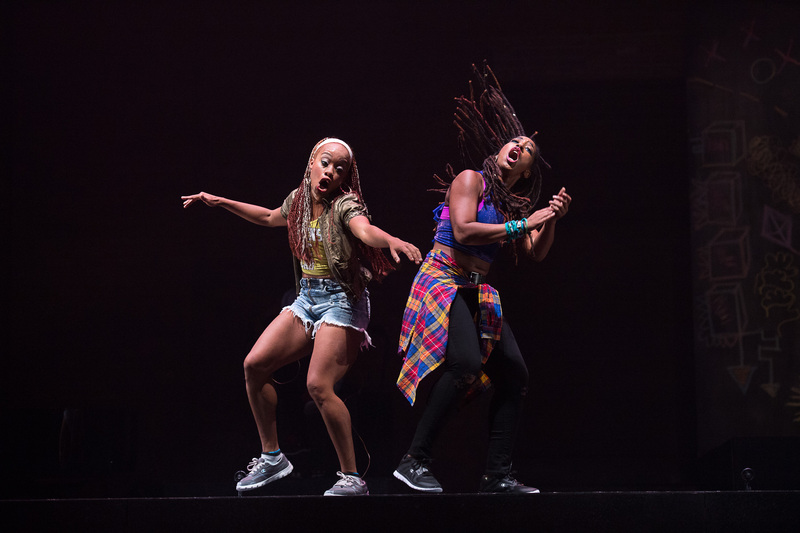 The hand games, double-dutch tricks, and step routines of neighborhood yards and sidewalks make their way onto the stage, and Brown and her dancers accentuate the rhythmic quality of this childhood movement language to perfection. In one moment, Brown and fellow dancer Catherine Foster rock from foot to foot in perfect sync, and when they suddenly bolt forward in unison, it’s a surprise that the jump ropes aren’t actually present. Later on, Brown keeps time for a fellow dancer, stamping and clapping an impossibly intricate beat that is constantly changing patterns for both hands and feet. As she performs this feat, Brown’s face is caught in an expression of complete determination – eyes closed, head cocked to the side. This is one of the only times that Brown gives away just how difficult these steps are to execute. Clearly, even when it’s time to play, she is not one to shy away from hard work. The percussive nature of the choreography makes up half the sound score. The other half is provided by electric bassist Tracy Wormworth and pianist Scott Patterson. Wormworth and Patterson are phenomenal together, and their light yet groovy touch complements Brown’s obsessive attention to rhythm and meter. Their compositions pick up on the work’s dream-like reminiscence and funky realness, two qualities that come alive particularly well in a duet for Beatrice Capote and Fana Fraser. Portraying competitive pre-teens discovering the power of friendship and sisterhood, Capote and Fraser’s section has the most turbulence. What kind of girl do you want to be? Though each dancer carves out her own movement identity, they can’t completely leave the past behind. In fact, the past gets all over them: the back wall of the stage is covered with chalk drawings, and as Capote and Fraser slide their bodies against this youthful mural of rainbow flowers and hearts, the residue of childhood imagery transfers onto their clothes, their hair, and their skin. It is a reminder that each of us is covered in history and tradition, and the foundations for our life stories begin well before childhood. Mora-Amina Parker offers Yusha-Marie Sorzano (in purple) a maternal hand. Photo by Christopher Duggan. If there is any one thing that can be said to describe BLACK GIRL: Linguistic Play, it is that this work is a dialogue, supporting exchange between the performers, between regional histories, and between viewers. 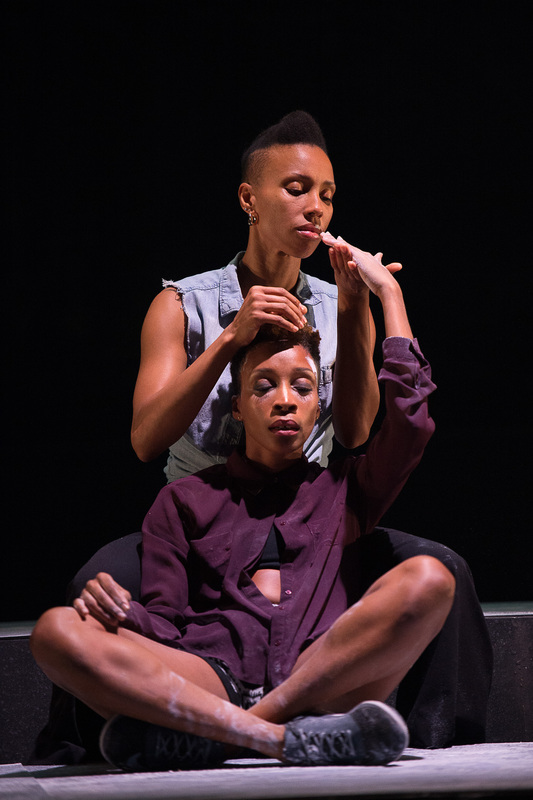 The second half of the program at the Joyce was devoted to a full-cast discussion with the audience about the work’s themes, particularly in regards to the underrecognition of black women and girls in many parts of the dance community. As viewers thanked Brown and her collaborators for their creation (for this work is certainly a treasure), it was clear that BLACK GIRL: Linguistic Play has achieved it’s goal of bringing the narrative of black girlhood to a places where it is sorely needed – the modern dance community, the traditional theater setting, and New York City, to name a few. Thanks to Camille A. Brown and Dancers, this conversation is far from over.